The latest breakout star to emerge from Quebec has yet to play a show west of his home province, but could you blame him? With the fervour and devotion the FME crowd showed Hubert Lenoir for his set last night (August 30), it would be impossible for an Anglophone crowd to keep up. Riding a wave of hype over the last six months that has included the release of Lenoir's debut album, Darlène, and a viral performance on the season finale of popular singing contest La Voix, Lenoir's brand of glam nationalism has turned him into a near-overnight sensation. His live performance only serves to heighten expectations moving forward. On stage, Lenoir is a dynamo, wholly embracing the retro-rock theatrics of his influences David Bowie and Marc Bolan. There were: onstage makeouts; stage dives; slow dances with crowd members; beer cans chucked from the edge of the balcony (that Lenoir had climbed onto, of course); setlists burned onstage; and impromptu Creed, Limp Bizkit, Whitney Houston, Green Day and Nirvana covers. None of this is to mention the actual songs of Darlène, which were given pitch-perfect live renditions courtesy of Lenoir and his six bandmates, including saxophonist André Larue and multi-instrumentalist Lou-Adriane Cassidy. The flamboyant glam rock tracks sounded excellent live, and Lenoir's exuberant stage presence imbued each track with explosive energy. It all served to make Lenoir's crowd-work all the more impressive, as he turned already-strong songs into live experiences. Lenoir didn't even bother to start singing "Fille de personne II," letting the crowd do the work for the first few lines before joining in. Lone English track "Wild and Free," a duet between Lenoir and Cassidy, found the pair crouched at the lip of the stage, which got the entire crowd quickly sitting, hanging on patiently to their every word. As Lenoir's national profile continues to grow ahead of his performance at the Polaris Music Prize gala in Toronto next month — only his second Canadian performance outside Quebec — his status in his home province remains strong, and is only getting stronger. The blueprints to making good retro rock have already been laid out, but there's something ineffably vital to Lenoir's cause. Strikingly androgynous, Lenoir embraces the iconography of his home province while also railing against its rampant conservatism. Case in point: his merch features an ejaculating fleur-de-lis. 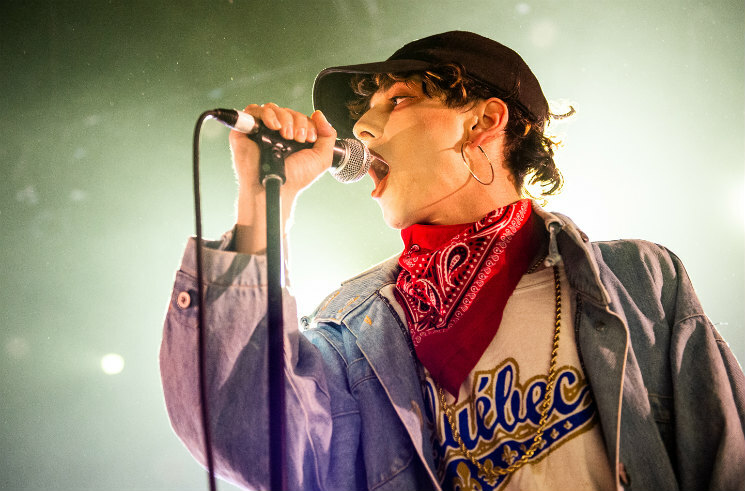 Bringing an exciting sensibility to Quebecois music, Lenoir's glam rock seems poised to catch on with the rest of the country. When it does, it will be on his own terms: raucous, uncompromising and tons of fun. The best thing Anglo audiences can do at this point is learn the words to Lenoir's songs — it'll only make the takeover easier on everyone.